Sie sind hier: Home » Allgemein » Drohendes Sardinenfangverbot: Welche Rolle spielen die atlantischen Ozeanzyklen? Drohendes Sardinenfangverbot: Welche Rolle spielen die atlantischen Ozeanzyklen? Überfischung, Klimawandel. Über die Gründe wird im Artikel nur spekuliert, handfeste Informationen fehlen leider. Die Portugiesen beteuern, dass sie die Sardinenfischerei nachhaltig betreiben, und trotzdem brechen die Bestände ein. Ob der Verweis auf den Klimawandel hilft? Und welchen Klimwandel, den natürlichen oder anthropogenen? Gibt es jetzt Klimaausgleichszahlungen für die portugiesischen Fischer aus dem 100-Milliarden-Dollar schweren Klimatopf? Dynamics of abundance and migrations of populations of small pelagic clupeoid fish such as anchovy (Engraulis encrasicolus), sardine (Sardina pilchardus), sardinella (Sardinella aurita), sprat (Sprattus sprattus) and herring (Clupea harengus) in the eastern North and Central Atlantic between Senegal and Norway vary in synchrony with the warm and cool phases of the Atlantic Multidecadal Oscillation (AMO). This is shown by compiling retrospective data on fish catches and anecdotal observations, which in some cases date back to the mid-19th century. 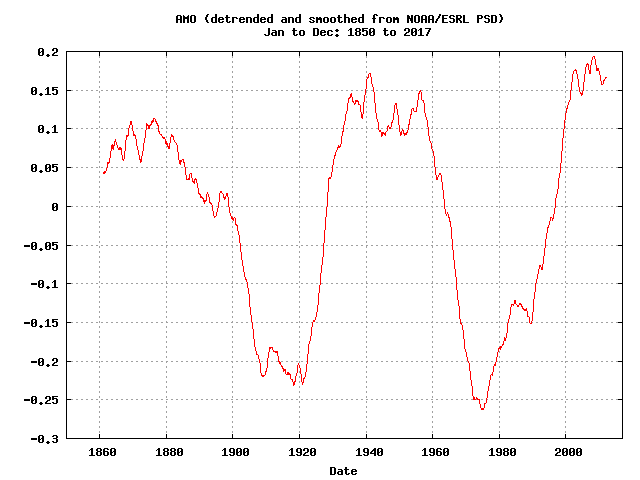 The AMO is defined as the de-trended mean of North Atlantic (0–60°N) sea surface temperature anomalies. However, it is not primarily the temperature which drives the dynamics of the small pelagic fish populations. Instead, the AMO seems to be a proxy for complex processes in the coupled atmosphere–ocean system of the North Atlantic. This is manifested in large-scale changes in strength and direction of the current system that move water masses around the North Atlantic and likely involves the North Atlantic Oscillation (NAO), the Atlantic Meridional Overturning Circulation (AMOC), the Mediterranean Overflow Water (MOW) and the subpolar gyre (SPG). The contractions and expansions of the SPG apparently play a key role. This was particularly obvious in the mid-1990s, when the SPG abruptly contracted with the result that warm subtropical water masses moved to the north and east. Small pelagic fish populations in the eastern North and Central Atlantic, including those in the Mediterranean responded quickly by changing abundances and migrating northwards. It seems that the complex ocean–atmosphere changes in the mid-1990s, which are described in the text in detail, caused a regime shift in the ecosystems of the eastern North and Central Atlantic and the small pelagic clupeoid fish populations are the sentinels of this shift. Population fluctuations and long-term abundance trends of sardine off NW Africa are difficult to interpret because of (i) climatically induced expansions and contractions of distribution ranges,(ii) historically different beginnings for the various national fisheries and (iii) movements of the fisheries’ fleets (Zeeberg et al., 2008). Kifani (1998) gives a good description of changes of the northern stock between Cape Spartel and Agadir Bay observed from the 1960s to the 1990s. Catches were low during the warm AMO period from 1936 until the 1960s, then started to increase with the beginning of the cold AMO period, peaked in the mid-1970s and were low again from the early 1990s on. Dazu werfen wir einen Blick auf die AMO-Kurve (Abb. 1). Die warme AMO-Phase reduziert die Sardinenpopulation, wohingegen die kalte AMO-Phase die Sardinen fördert. Und da wir uns momentan wieder in der warmen AMO-Phase befinden, wundert es kaum, dass die Sardinenzahl abgenommen hat. Abb. 1: Verlauf des AMO-Ozeanzyklus während der letzten 150 Jahre. Quelle: NOAA. Fünfzehn Jahre Fangmoratorium werden gefordert. Wann kühlt die AMO ab, wann ist mit einer natürlichen Erholung der Bestände zu rechnen? Schreibt man den 60-Jahreszkyklus der AMO fort, dann wird die AMO wohl in der Tat in den kommenden anderthalb Jahrzehnten in der positiven Phase bleiben (Abb. 2), was den Sardinen so gar nicht behagt. 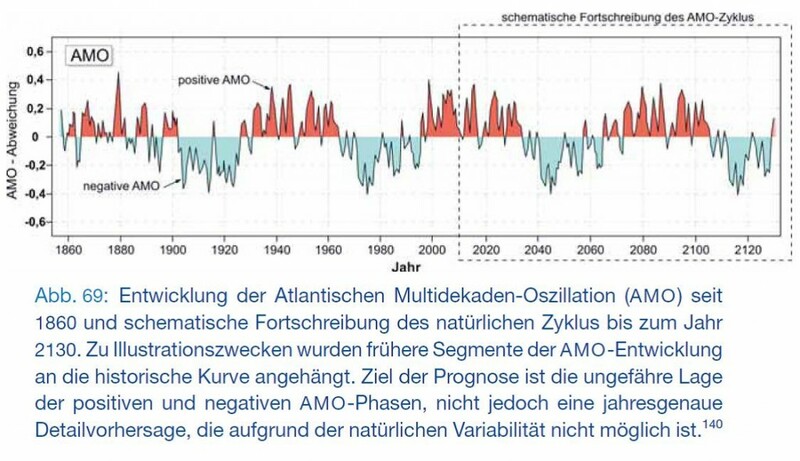 Eine reduzierte Fangquote könnte daher durchaus Sinn machen, um die Zeit zu überbrücken, bis die Wassertemperaturen wieder absacken. Abb. 2: AMO-Prognose. Aus unserem Buch “Die kalte Sonne”. Nun spielen aber offenbar auch der andere atlantische Ozeanzyklus, die NAO, eine Rolle (z.B. Ottersen et al. 2001). Auf jeden Fall lohnt es sich, die Literatur etwas genauer anzuschauen, bevor hinsichtlich der Sardinenfangquoten weitreichende Entscheidungen getroffen werden.